Details: Dietary Supplement. 24Hr weight control. 4 Burn, detox. » 1 Energize, relax. 15 Day capsules. 15 Night capsules. Maximize your weight loss efforts! Weight loss is easier to achieve when you start by internally cleansing your body to get in working right. 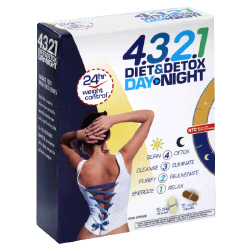 Use 4321 Diet & Detox Day, Night in conjunction with a calorie conscious diet and exercise program. Contains caffeine (average of 10mg per day capsule). 4321 Diet & Detox Day, Night has been formulated on the basis of chronobiology delivering nutrients to the body at the optimum time to ensure they work in synergy with the body's metabolism for maximum efficacy. 4321 Diet & Detox Day, Night combines a day capsule for a get-up-and-go slimming action first thing in the morning and an extended-release night capsule. RTC (round the clock) technology for night-long action. 4321 Diet & Detox Day, Night is even more effective because it contains Grapemax, an extract obtained from viticulture (the quality cultivation of grapes), which improves the richness of its detoxifying active ingredients. » Green tea to burn. Barley, mate to cleanse. Fennel, celery to purify and kola to energize. » Chicory to detox. Bean pod powder to eliminate. Grapemax to rejuvenate and hawthorn, lemon balm to relax. These statements have not been evaluated by the Food and Drug Administration. This product is not intended to treat, cure, prevent or diagnose any disease. Ingredients: Day Capsule: Other Ingredients: Gelatin, Magnesium Stearate, Cellulose, Titanium Dioxide and Iron Oxide, Caffeine. Night Capsule: Other Ingredients: Cellulose Derivative, Gelatin, Magnesium Stearate, Cellulose, Titanium Dioxide and Caramel. DirectionsWith a large glass of water, take one light capsule at breakfast and a dark capsule at bedtime.